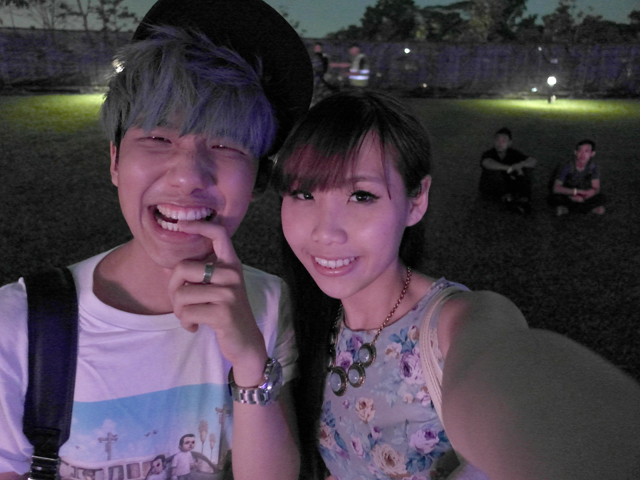 Today I'm going to blog about the Singapore Social Concert that happened last month! But let me say something first. The whole entry only have one photo of the concert. And it's a faraway photo that cannot even see who is on stage. Hahaha. 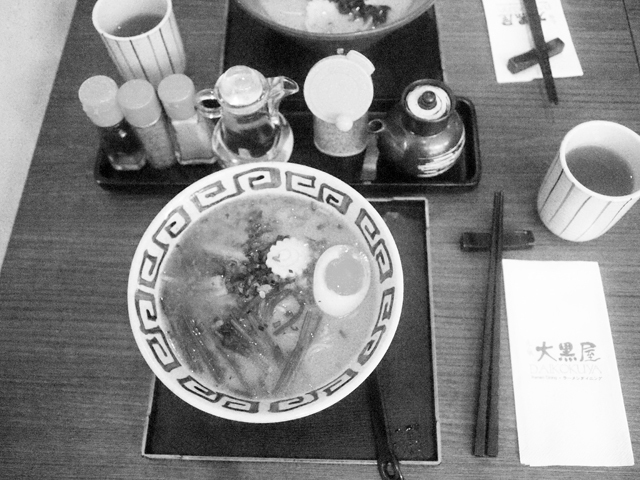 Anyway, met up with Ben for food before the concert and we had ramen at this Japanese rstaurant. Food was only okay. But we were so caught up with our conversation that we totally forgot about the concert. Lol. The concert starts 7pm but we only realize we were late at around 6.45pm. 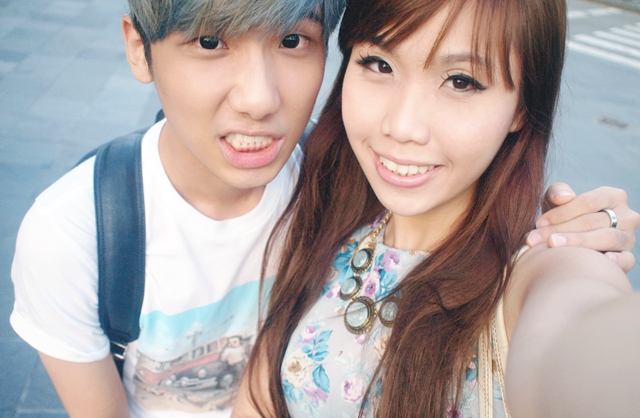 Nevertheless, we still took our time to take OOTD and photos before heading off to Gardens By The Bay. Haha. My blue dress is from Earthdoll, located at Bukit Panjang Plaza #03-21. Do check out the clothes there as the prices are mostly $10-$15 only! This photo below onwards except last photo, are all from Ben's camera. 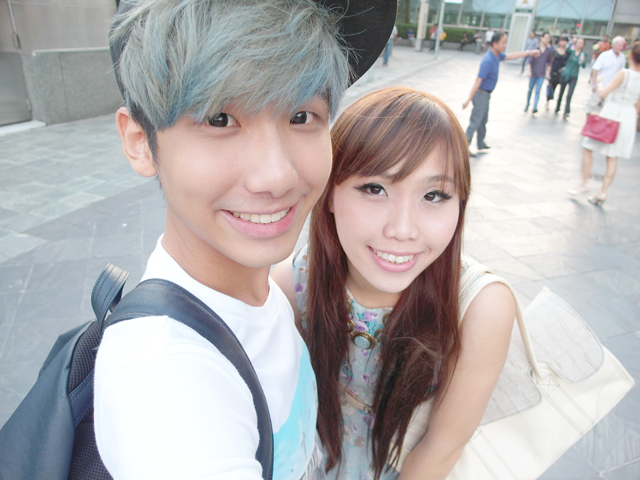 Under sunlight SO NICE RIGHT!!!! So bright and white and wide enough to show the background when taking self pics! Love the the white balance too. You can compare the photos above and this one, mine has the yellowish tone but his camera makes the photo look fresher. I have decided that it will be one of the choice for my next camera! Even when it's dark still can take quite okay photos! Here's the faraway stage photo. Check out the crowd!!! There were SO MANY people there that day. When we reached, which was quite late, we saw a lot of late comers queuing outside too.We stood quite far away from the stage as we didn't want to step on the muddy ground. It was very hot standing amongst the crowd and after awhile we went to stand at the hill behind which had lots of people sitting on picnic mats they brought themselves. It was much more spacious there and a whole lot breezier. The only thing we lacked was a mat. Should have brought one along! 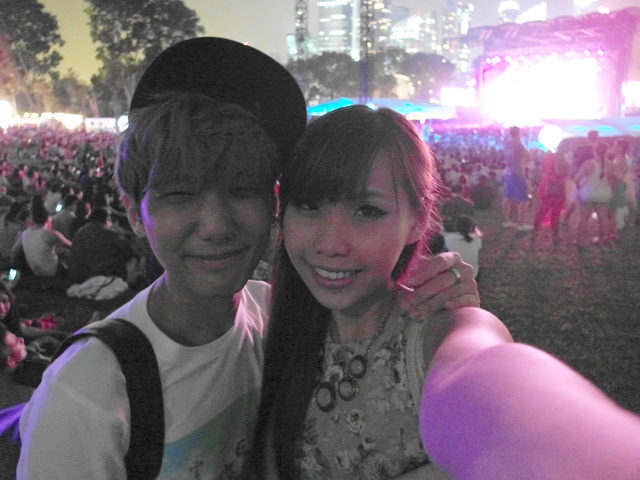 Grainy photo but you see the background, got "music festival" feel right!!!!! Like very happening hor? Hahaha and the stage is so far away. Lucky got big screens which we looked at all night. Actually I was looking forward to only 3 songs. Call Me Maybe by Carly Rae Jepson and the two hit songs Gangnam Style and Gentlemen by Psy. Carly Rae Jepson sang for around 1 hour and she only sang the song I wanted to hear at the end of her songs lineup. I was almost afraid that she would skip that song for this gig!!! The crowd was most active when Psy appeared. We left after Psy left by the way. 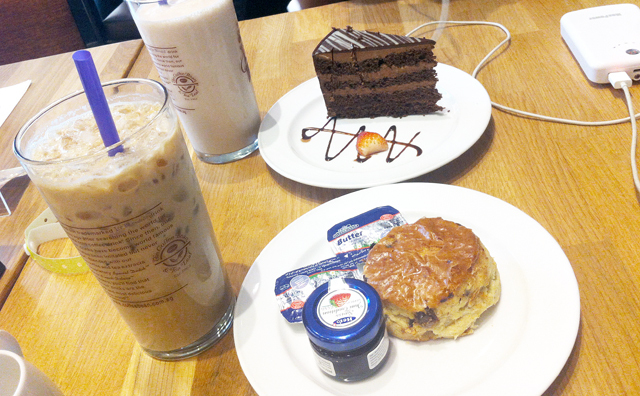 Wanted to fill our stomachs with savoury food so we went to Coffee Bean at Marina Bay Sands. Was only told that the kitchen was closed after we sat down so we had scone and cake instead. So unsatisfying because what we really wanted was real food!! hi. which camera is Ben using?